This moose belongs to me on TheBookSeekers. Wilfred owned a moose. He hadnt always owned a moose. The moose came to him a while ago and he knew, just KNEW, that it was meant to be his. He thought he would call him Marcel. Most of the time Marcel is very obedient, abiding by the many rules on How to Be a Good Pet. But one dark day, while deep in the woods, someone else claims the moose as their ownIs Marcel really Wilfreds pet after all? An beautifully-illustrated, witty and thought-provoking story, exploring the concept of ownership. 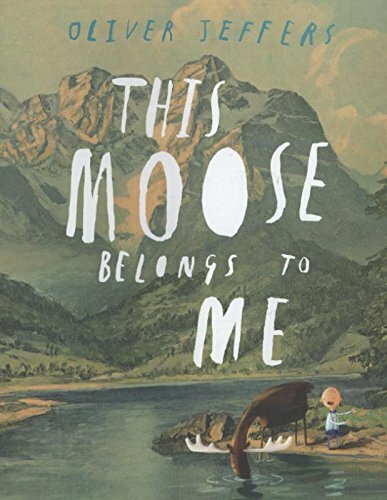 This moose belongs to me by Oliver Jeffers has not been rated for age or fabulousness yet on TheBookseekers. There are currently no reviews for this book on this site. Click on the + buttons to include your own ratings! This moose belongs to me is an illustrated book and features the illustrations of Oliver Jeffers. It was written for young readers to enjoy.